Montreal is a vibrant, unique city representing, maybe better than any other, Canada's French and English heritage. A patchwork of varying neighbourhoods comprise one bustling, multicultural city that draws millions of visitors every year. But if you're travelllng with kids, getting the sour, "I'm bored" looks off their faces becomes your main priority - and doing it without going to a Chuck E. Cheese's is ideal. If you are in Montreal with kids, keep them happy and enjoy local history and flavour - just balance your day between visits to churches and museums and to outdoor parks, play structures and interactive, kid-friendly attractions. Four facilities comprise Space for Life, Canada's largest natural sciences museum complex: the Biodome, Insectarium, Planetarium and Botanical Gardens. All four buildings are located within a 15 minute walk of one another and a group pass is available, making visiting more than one museum feasible and economical. The Biodome, which features five ecosystems - complete with differing climates, landscapes and wildlife - is probably the highlight. Your Space for Life journey begins through a lush, steamy tropical forest, where you'll hear the howls of monkeys and exotic birds, and ends in the chilly sub antarctic islands with hundreds of penguins. Space for Life is easily accessible by a 30 minute subway ride or about 20 minutes by car. Saint Joseph's Oratory in Montreal is a popular pilgrimage for Roman Catholics, but also attracts people of any faith for its historical and architectural significance. If nothing else, kids can run their sillies out by racing up the two-hundred and eighty three steps that lead to the oratory (the true pilgrims do the first 99 on their knees!). The site is accessible for those with reduced mobility. The original Saint Joseph's Chapel has a background story that kids find fascinating. It was founded in the early 1900s by the unassuming and diminutive Brother André, a man with the reputation for healing the "unhealable" and performing other small miracles. This "Miracle Man of Montreal" spent his life helping others, spreading the word of God and honouring Saint Joseph, patron saint of Canada. Though Brother André died in 1937, the building of Saint Joseph's Oratory continued on till its completion in 1967. Today, the Oratory's dome ranks as the third largest of its kind in the world. In addition, its cross represents the highest point in Montreal. The oratory has large grounds with gardens and green space amongst kids can run around. In addition, kids will enjoy lighting candles in the crypt. Bonus points for free parking and entrance to everything except the museum which is $5 (as of 2016). In no way cultural or historic, Voiles en Voiles - new in 2016 - is a welcome addition to the Old Montreal landscape as a purely physical and fun way for kids to work off a little pent up energy after or before enduring historic tours, church visits and museums. Located outdoors right by the water, two pirate ships form a gigantic ropes and obstacle course with various skill levels. Right next door is the Montreal Zip Line, which, is operated separately but tickets can be bought as a package with Voiles en Voiles. There is no height or weight restriction for Voiles en Voiles as a whole but there are for the different skill levels. Make sure you have proper footwear - no flip flops. The price packages are confusing and lines can get very long, so best advice is to go first thing after buying a 2 or 4 hour pass and try not to get stuck behind someone slow. Once they're are exhausted from climbing, they will be in fine form to make it through a visit to Notre Dame Basilica, which is not too far away. A great starting point to your visit to Montreal is this museum that sits upon the spot where the founding fathers celebrated the birthplace of Montreal. Pointe-à-Callière comprises actual archaeological digs and excavation sites of original Montreal settlements, thereby telling the city's story in a uniquely tangible way. The museum is like a living time machine that visitors walk through, with authentic studies, displays and artefacts along the way. The free guided tour is an excellent way to enhance your understanding of what your seeing, but be sure to begin your visit with Yours Truly, Montréal, a captivating 18 minute multimedia presentation on the history of Montreal. Pointe-à-Callière is best suited to kids over 4 or 5 years of age, as it is somewhat academic, though the Pirates or Privateers? interactive exhibit is well-suited to younger children. The McCord Museum is a moderately sized museum that is easy to manage and navigate and usually has interesting exhibits drawing on the history of Montreal. Fashion time periods, dolls and toys, aboriginal artefacts are common themes for exhibits. The McCord Museum is modest, without a ton of "wow" factor, like special effects or interactive exhibits, so keep this in mind if you plan to bring very young children or kids who aren't used to museum visits. However, the museum's integrity is really part of its charm. It also has a great, little gift shop and café. Located close to downtown Montreal on Saint Helen's Island (Île Sainte-Hélène, pronounced eel-sant-el-len), La Ronde is a Six Flags-owned amusement park popular for its range of rides for kids through to adult thrill-seekers. Opened during Expo ’67, La Ronde offers more than 40 rides and attractions, including the Goliath, one of North America’s highest and fastest roller coasters, and Le Pays de Ribambelle, an fun family area. La Ronde has the Flash Pass, which is a virtual ride reservation system that can be purchased at an extra cost. It holds your place in line electronically, so you can spend time elsewhere. When it's almost your turn, your Flash Pass alerts you. La Ronde holds a popular, international fireworks competition during the summer,Montréal International Fireworks Competition. Don't worry if you don't have skates, rentals are available, so there is no excuse not to partake in this quintessentially Canadian past time. The Bonsecours Basin outdoor skating rink - on De la Commune Street between the St. Lawrence River and Old Montréal is scenically situated with the glimmery Marché Bonsecours and old city as backdrop. Theme nights, including disco, romance or retro, live DJ, pumping music and party lights will make you forget your toes are frozen in no time. The rink is open seasonably from end of November to March . Find other other outdoor Montreal skating rinks. Notre Dame Basilica, completed in 1829, is on most visitor's list of must-see attractions in Montreal, and is particularly famous as the backdrop for Celine Dion's wedding to Rene Angelil and his funeral 21 years later in 2016. The impressive Gothic Revival church as it stands now was built in the mid 19th century. It has a stunning, colourful interior and stained glass windows that depict the history of Montreal. Free tours - in either French or English - are available to anyone who has paid the modest admission fee (about $5 and free for kids 7 and under). The French and English conflict that provides context to the church's history combines with the intense beauty of the church interior to make for a sumptuous experience. The tour requires only about an hour, so bringing kids along is a reasonable undertaking. Very much a hub of Old Montreal, Jacques Cartier Square (or, Place ("Plass" Jacques Cartier) is buzzing with activity year-round but especially in summer, when it is a designated pedestrian-only zone full of artists, performers and excitement. 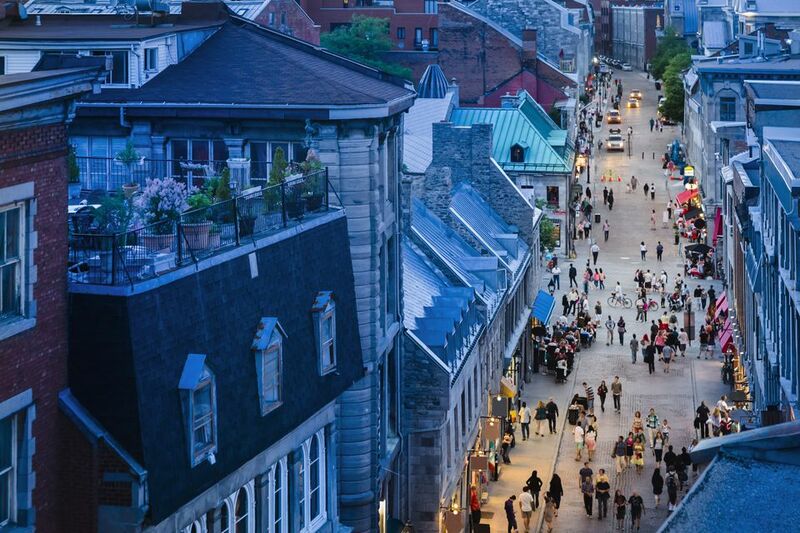 In the 19th century, this section of Old Montreal that gently slopes down toward the St. Lawerence River was a thriving marketplace. Today the same energy pervades but it is filled with tourists dropping their dimes at one of the many terraces or on local artwork. In winter, a long ice slide bisects the square. Snow taffy stands and colourful lighting contribute to the festive, magical atmosphere. In summer, street performers entertain the crowds with song, dance, magic acts and more. (Mont Royal - pronounced "mawn-ree-yal" in French) and in particular, the Mont Royal Cross, acts as a natural landmark and way to orient yourself in Montreal. Hike, bike, drive or take a bus to the top of Mont Royal and enjoy the great view and park designed by Frederick Law Olmsted, famous for his work on Central Park in New York City. Mont Royal Park includes a small, man-made lake, playground, lookouts, and walking paths. Access to the park without a car is free.